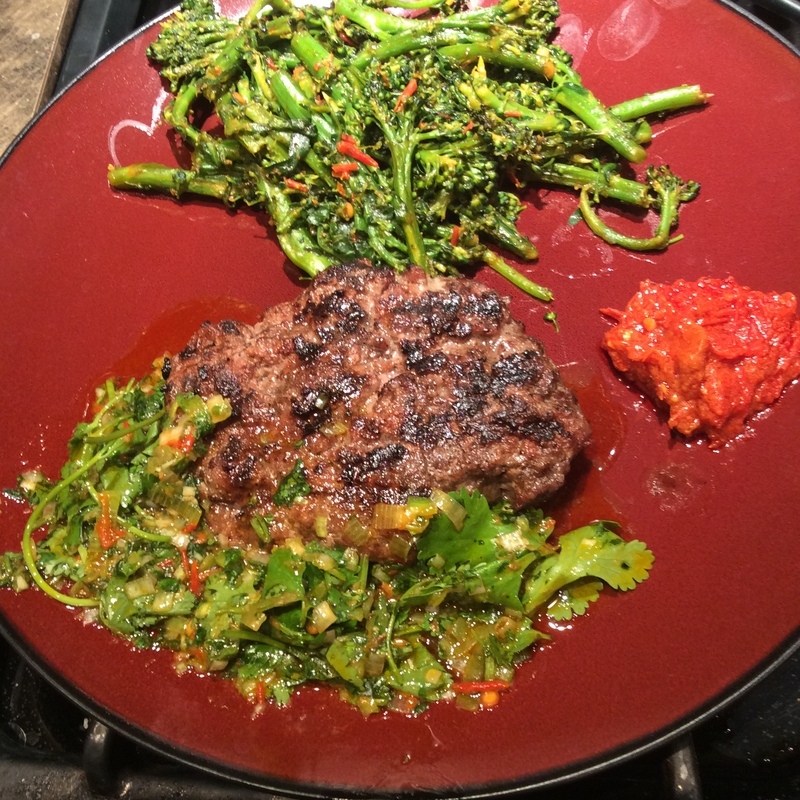 I love chimichurri, the ground herb table sauce of Argentina, but I am by no means faithful to the Argentinian version. If you have an active garden, spring offers the first of infinite variations of chimichurri to accent any grilled meat or poultry. These savory herbal sauces also dress up baked and roasted foods, and are a great way to perk up hard-boiled or fried eggs. People who don’t have to stay low-carb may like them drizzled on bread or rice. Vegetarians will like chimichurri on roasted vegetables, and for that matter ardent carnivores would love it on roasted carrots, broccoli, and other meaty veggies. I can imagine it freshening and enlivening roasted or grilled oyster mushrooms. The basic necessary ingredients are olive oil, garlic, an acid, salt, herbs, and embellishments. Variables are the herbs, the texture, and the embellishments and degree of heat, if any. Oil: I say very good olive oil is a necessity. If you choose to fool around with other oils, feel free. Plan on between a half cup and one cup. Garlic: green in spring, mature cloves later on. 2-3 large stalks of green garlic or 3-4 cloves of mature garlic. Acid: vinegar is traditional but lemon juice is delicious with the more delicate spring versions. Consider wine vinegar or sherry vinegar. Plan on about 2 tablespoons and have extra available to add if needed. Please, don’t use sweet caramelized ersatz “balsamic” vinegars. Yech. Salt: “Plenty” is the important concept here. Some chimichurris that seem like failures come alive when enough salty element is added. Remember, this is a seasoning sauce, not a main dish.Your salt element may be sea salt, but a good dab of anchovy paste or a glut of the salty-lemony fermented liquid from preserved lemons may attract you. Herbs: parsley is traditional and great, but don’t feel bound. Cilantro is a great alternative for the “bulk” herb, of which you’ll need a bunch (from the store) or a large handful (from the garden.) Oregano, sweet marjoram, summer savory, thyme, and lemon thyme are great options for the subsidiary herb, of which a small chopped handful (combined if using multiple herbs) is plenty. Combos are potentially wonderful. I don’t recommend tarragon for this sauce, but feel free to prove me wrong, and I think rosemary should be limited to a chopped teaspoon or two if used at all. Some mint is a possibility if used judiciously. Sage is difficult to use and, in my view, not a good possibility.But suit yourself, as long as you are pursuing a coherent taste-vision. Wander your garden, be seducible, and work it out later. Embellishments: Heat is an important possibility. Hot sauce, harissa, and ground dried chiles can all work wonders, and fresh chopped jalapeños (seeded or not per your preference for fire) can do real magic. Anchovy fillets mashed can add a savor and tang that are the making of rich meats like roasted lamb or goat. Preserved lemon peel, finely chopped, is highly nontraditional but extraordinary in the right circumstances. A pinch of toasted cumin seeds, finely ground, can give an earthy, sweaty, quintessentially masculine note that makes a simple grilled steak or chop memorable. Texture: can be anywhere from medium-fine grind to as coarse as a chopped salad. It all depends on your mood and your main dish. Chop your garlic coarsely or slice finely crosswise if using green garlic and put in a large mortar or small food processor; I invariably use my little stoveside Mini-prep. Chop or pound to desired degree. Add herbs, salt, and embellishments and process only until you like the texture. Add the acid and salt, process briefly, and work in the oil. Now taste, and think. If you are sure it didn’t work, think about how to rebalance and save it. Sorry to harp, but insufficient salty element is a common fault. Increase the salt, anchovy paste, or preserved lemon juice, or add a bit of the latter two if you didn’t use them before. If overly salty or acid, add more oil to smooth it out. If bland, add a little more acid. If just not that interesting, consider stirring in more chopped herb or some heat. This sauce can be refrigerated overnight and may be even better the next day, although cilantro-based versions tend to lose freshness and pizazz and are best consumed on sight. This sounds really good. Our cilantro is about to bolt in the greenhouse, and green garlic is all around, so I think I will be making some large batches of this stuff! Loved the format of this post too! Hope you enjoy it, and thanks for your comment on the format. I’m a great believer in improvisational cooking, because it is what comfortable cooks do all the time, but it is emphatically not just “throwing stuff in.” You start with a taste vision and use what contributes to that vision, and leave out what doesn’t. By the way, if you get a chance, do read the chapter on improvisational cooking in Richard Olney’s Simple French Food. All these decades later, it is still one of the best things written on the subject. I will hunt it down to the very last now that you’ve recommended it. Thanks!